I’ve been in the sciences almost all my life, but a path in the arts is not altogether strange. Since I was a kid, I can always remember sneaking in creative projects when I should have been working on homework. When I wasn’t being a geeky scientist type, I was definitely that stereotypically doodling or daydreaming student who people wondered if he should be a cartoonist instead. It wasn’t just drawing that I liked, though. In fact, back then, I was probably more into making things. Here’s something I did for fun one winter weekend during grad school. I had heard that Chinese artists used to paint the insides of glass spheres with paint brushes consisting of only two hairs. So I gave that a try with a clear glass Christmas ornament. 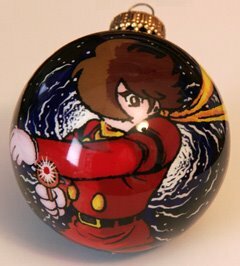 I chose as my subject one of my favorite characters, Joe Shimamura, from Shotaro Ishinomori’s classic manga, Cyborg 009. I used toothpicks and carefully added animation paint through the hole where the hook attachment goes in at the top. Because you’re looking at the paint applied to a smooth surface, it looks as if it were a polished stone. In any case, I got back into plastic modeling during grad school (notice the pattern? 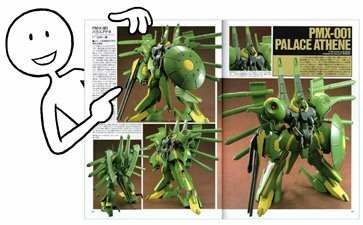 ), and tried my hand at scratch building the mecha, Palace Athene (no, that’s not a typo), from the anime series Z Gundam. Normally, with plastic modeling, you’d buy a kit that comes in many parts that you’d glue together and paint. For a full-scratch build, the pieces are hand-made, carved out from polyester putty and polystyrene sheets. And, where needed, duplicates of the pieces are made by casting polyurethane resin in silicon rubber molds. Like any project, it helps to have a deadline, so I decided to make this for submission to the national Orazaku competition sponsored by Hobby Japan magazine. I remember getting really frustrated at times with the difficulty of crafting certain pieces or the engineering of the joints. I also had to rush through the paint job in one frantic all-nighter so that I could make the deadline. But in the end, it did pretty well, managing to win third place out of eight hundred or so entries. 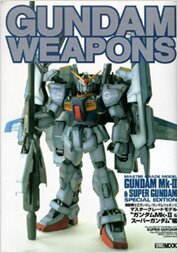 One of the judges, who was the editor responsible for overseeing Gundam stuff in Hobby Japan, liked it so much he featured it in a Gundam Weapons book and asked if I’d like to write some articles for them. But that didn’t pan out because I really had to finish grad school in some reasonable amount of time. Now that I’m working, I can afford to buy the plastic model kits. But these days, having no time for these extra projects, I’ve become a stack’em up modeler who uses more closet space than his wife. (She’s not too happy about this.) But, getting back to topic, I need to get this manga career off the ground, so it’s bye-bye to Gundam plastic models for the time being.